Majestic marquise birthstones form the centerpiece of the Duet. 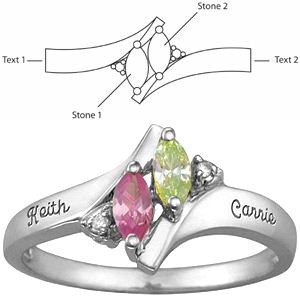 Engrave up to 12 characters in each of two engraving areas. The Duet ring features personalization for two prong-set 5x2.5mm [25pt] marquise birthstones. Cubic zirconia 1mm [1/2pt] accents. This ring is available with simulated or genuine birthstones. This ring is always set with two birthstones. Made in the USA.